Small and medium South Korean companies called LSD Tech that has super-fast disk I/O (input/output) technology and CoCoLink that manufactures GPU-based super-high-performance operational super-computers are joining hands to build a super-computer. 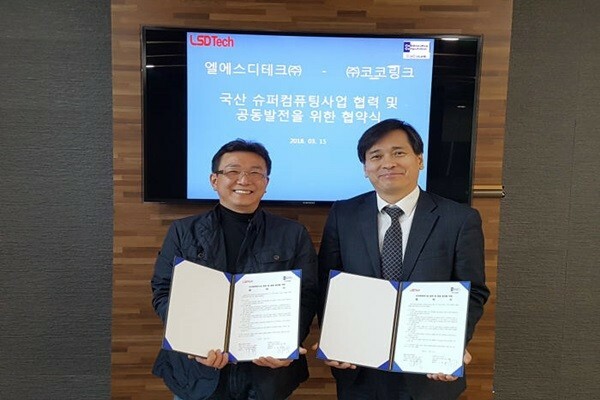 LSD Tech and CoCoLink recently held an ‘Agreement Ceremony for Cooperation and Co-Development in South Korean Super Computing Business’ and made an announcement that they will be producing super-computers for analyzing informal data. LSD Tech has MAC-T technology that maximizes performance of CPU and disk I/O. MAC-T technology combines transaction process units into group units and carry out parallel processing. It also increases performance that is more than doubled of normal SSD’s performance while minimizing use of memories. LSD Tech’s SSD servers were supplied to KT, POSCO Engineering, and Agency for Defense Development. CoCoLink, which is a subsidiary of Seoul National University Holdings, has technologies for architecting super-computers and works with foreign organizations and businesses. It has one of the best capabilities in transferring and optimizing codes in GPU programming. It recently released 1.26 PetaFLOPS super-high-performance ready-built cluster super-computer called ‘Klimax-PetaCube’. 1 PetaFLOPS is equivalent to speed that can calculate 1,000 billion times in a second. LSD Tech and CoCoLink decided to join hands to deal with amount of informal data processing that has quickly increased in recent times. Super-computers had been evaluated based on performance of their CPUs, GPUs, and memories. However this type of evaluation omits a process of bringing in files from disks and it is a method that is not suitable for generations of Industry 4.0 when there will be increased amount of informal data such as videos, documents, and pictures. LSD Tech and CoCoLink are going to combine their disk I/O performance and performance of GPU-based super-computer into single super-computer. It is expected that this super-computer will demonstrate world’s best performance when it is compared to single node. It is possible that it will display twice or three times faster speed than current super-computers. CoCoLink produces 0.14PF speed through single node while LSD Tech has capabilities to process 600,000 IOPS (Input/Output Operations Per Second). 600,000 IOPS is equivalent t speed that can read and write 2,000 Korean characters 600,000 times.